Independent journalist Garry Leech has spent the last eight years working in the most remote and dangerous regions of Colombia, uncovering the unofficial stories of people living in conflict zones. Beyond Bogota is framed around the eleven hours that Leech was held captive by the FARC, Colombia’s largest leftist guerrilla group, in August of 2006. He recalls nearly thirty years of travel and work in Latin America while weaving in a historical context of the region and on-the-ground reporting with each passing hour of his detention. More than $5 billion in U.S. aid over the past seven years has failed to end Colombia’s civil conflict or reduce cocaine production. Leech finds that ordinary Colombians, not drug lords, have suffered the most and that peasants and indigenous peoples have been caught in the crossfire between the armed groups. Meanwhile, more than thirty Colombian journalists have been murdered over the last three decades, making Colombia one of the most dangerous countries in which to practice journalism. Consequently, the majority of the Western media rarely leave Bogota to find the real story. Leech, however, learns the truth about the conflict and the U.S. war on drugs directly from the source: poor coca farmers whose fields and food crops have been sprayed with toxic aerial fumigations, female FARC guerrillas who see armed struggle as their only option, union organizers whose lives are threatened because they defend workers’ rights, indigenous peoples whose communities have been forcibly displaced by the violence, and many others. Leech also investigates the presence of multinational oil and mining companies in Colombia by gaining access to army bases where U.S. soldiers train Colombian troops to fight the guerrillas in resource-rich regions and by visiting local villages to learn what the foreign presence has meant for the vast majority of the population. "That havoc within Colombia is portrayed with angry passion by the determined Garry Leech, that now rare beast in the jungle of journalism prepared to put his own life at the service of the truth. Beyond Bogotá is a remarkable and captivating personal account of the drug war that unfolds mostly in Colombia. The author also describes it as a search for meaning in the midst of violence and poverty." "Exciting . . . enlightening . . . journalism in its purest form." "Eye-opening look at the drug war in Colombia . . . Excellent reportage—highly recommended for would-be journalists as well as those interested in geopolitics." 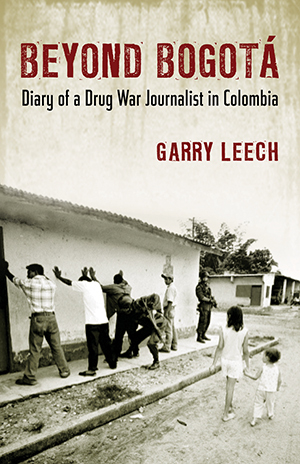 "In this arresting hybrid of journalism and memoir Leech relates his experiences investigating political, economic, and drug-related stories throughout Latin America. . . This enlightening book, which mixes a readable level of detail and background with personal narrative, should be in every library, public and academic."